a solid, irregularly lobed organ of bizarre shape, usually situated in the pelvis toward the midline, produced by fusion of the renal primordia. A solid, irregularly lobed organ of bizarre shape, usually situated in the pelvis toward the midline, produced by fusion of the primordia of the kidneys. 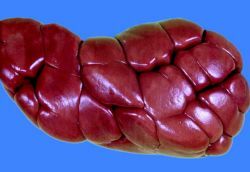 One of a pair of purple-brown organs situated at the back (retroperitoneal area) of the abdominal cavity; each is lateral to the spinal column. 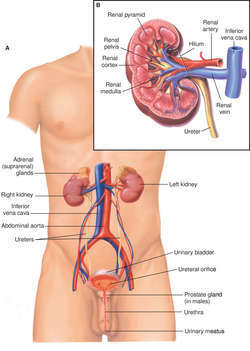 The kidneys form urine from blood plasma. They are the major regulators of the water, electrolyte, and acid-base content of the blood and, indirectly, all body fluids. The top of each kidney is opposite the 12th thoracic vertebra; the bottom is opposite the third lumbar vertebra. The right kidney is slightly lower than the left one. Each kidney weighs 113 to 170 g (4 to 6 oz), and each is about 11.4 cm (4 1 2 in) long, 5 to 7.5 cm (2 to 3 in) broad, and 2.5 cm (1 in) thick. The kidneys in the newborn are about three times as large in proportion to body weight as they are in the adult. Urine is about 95% water and about 5% dissolved substances. The dissolved materials include minerals, esp. sodium, the nitrogenous waste products urea, uric acid, and creatinine, and other metabolic end products. The volume of urine excreted daily varies from 1000 to 2000 ml (averaging 1500 ml). The amount varies with water intake, nature of diet, degree of body activity, environmental and body temperature, age, blood pressure, and many other factors. Pathological conditions may affect the volume and nature of the urine excreted. However, patients with only one kidney have been found to have normal renal function even after half of that kidney was removed because of cancer. There is no evidence that forcing fluids is detrimental to the kidneys. 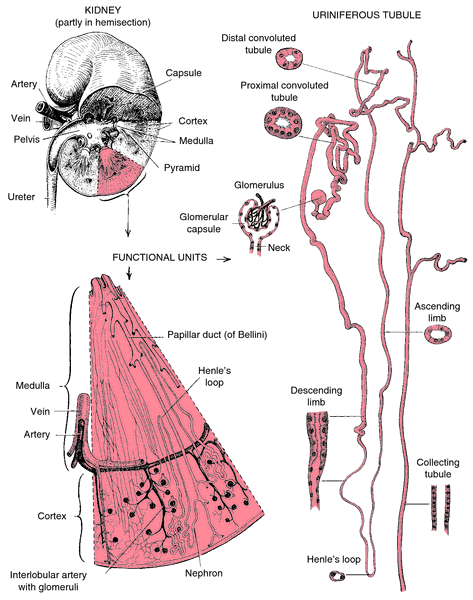 The nerve supply consists of sympathetic fibers to the renal blood vessels. These promote constriction or dilation, esp. of arteries and arterioles. The kidneys are examined by palpation, intravenous pyelography, ultrasonography, computed tomography scan, cystoscopy, retrograde cystoscopy, or magnetic resonance imaging. Kidney function is also frequently examined with blood tests (e.g., for electrolytes, blood urea nitrogen, and creatinine) and by urinalysis or timed collections of urine. Infected persons typically lose large quantities of protein in the urine and may present with edema or symptoms of fluid overload, nephrosis, or renal failure. 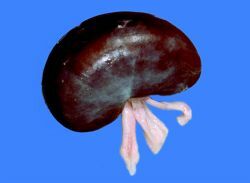 The abnormally small kidney found in end-stage renal disease. A kidney that has undergone cystic degeneration. A kidney with fatty infiltration or degeneration of tubular, glomerular, or capsular epithelium, or of vascular connective tissue. A kidney with small petechiae covering the surface, a pathological finding in bacterial endocarditis and some other systemic illnesses. A kidney that is displaced and movable. 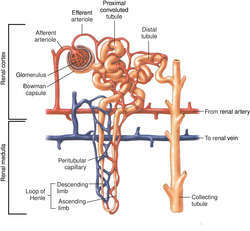 A condition in which the kidneys are joined into one anomalous organ. A congenital malformation in which the superior or inferior extremities are united by an isthmus of renal or fibrous tissue, forming a horseshoe shape. A congenital condition characterized by the presence—seen best during urography—of spongy or porous appearing renal collecting tubules. The disease may be asymptomatic or may cause urinary bleeding, stone formation with renal colic, or recurrent urinary tract infections. A condition in which the kidney has been absorbed and only the distended capsule remains. The computed tomographic (CT) appearance of the kidneys in patients who develop chronic kidney disease from the overuse of analgesic medications like acetaminophen, aspirin, ibuprofen, or phenacetin. Kidney with fibrous bands running across it, and caseating gummata, as a result of syphilis.